Some of you have been asking us why the 5-inch budget device Ulefone U007 has been unavailable since one month ago. Well, it’s no way that we would cease the production of a stuffed so loved by people. 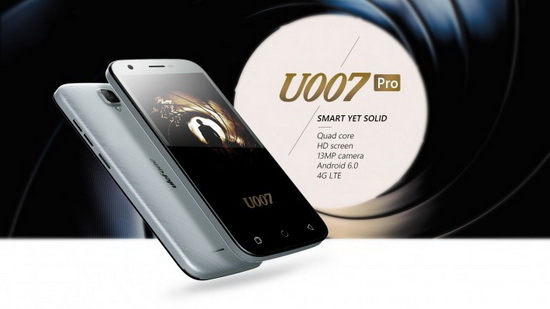 Actually we have upgraded the U007 and now comes the Ulefone U007 Pro. Compared with the original Ulefone U007, the U007 Pro has only one but important change, which is the chipset being upgraded from MTK6580 to MTK6735, which means the pro version will support 4G LTE. Besides, the Mali-T720 GPU with MTK6735 is much better than MTK6580’s Mali-400 and will bring better gaming performance. For other specs, Ulefone U007 Pro is equipped with 5-inch HD display, and Sony IMX149 camera (interpolated to 13MP), running on Android 6.0 operating system. With removable back cover, Ulefone U007 Pro supports two SIM cards and one SD card at the same time. Now you can buy Ulefone U007 Pro on Gearbest for only USD69.99, perhaps the best price of a 4G smartphone.